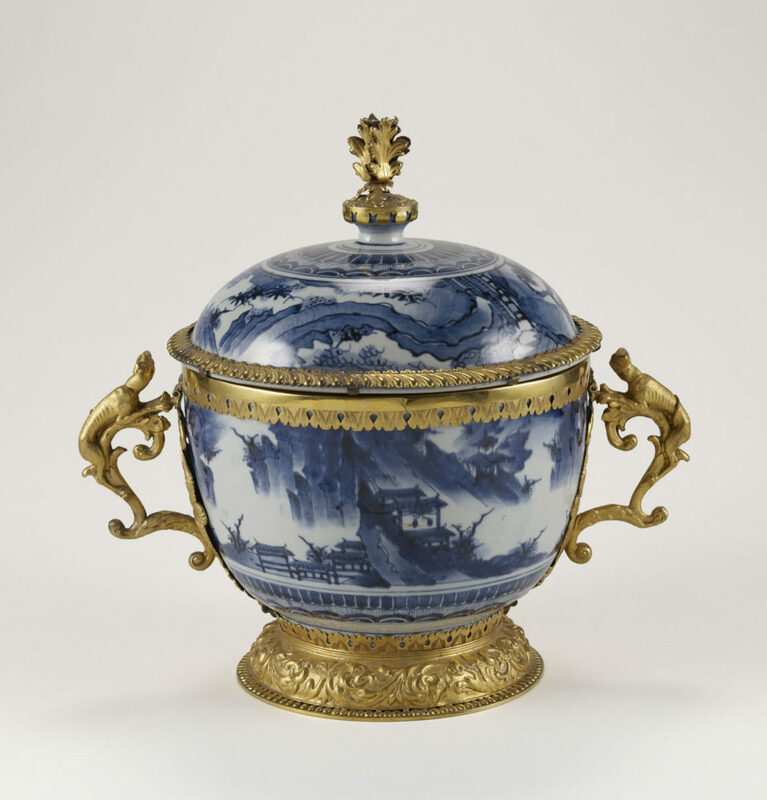 A pair of lidded bowls in the J. Paul Getty Museum have had quite an exciting existence. Though they are inanimate, we know much about the bowls’ history from research, comparison with similar objects, and visual clues on the works themselves. The large porcelain bowls and matching lids were most likely produced at a kiln in or around the Japanese town of Arita, on the southern island of Kyushu, between about 1660 and 1680. 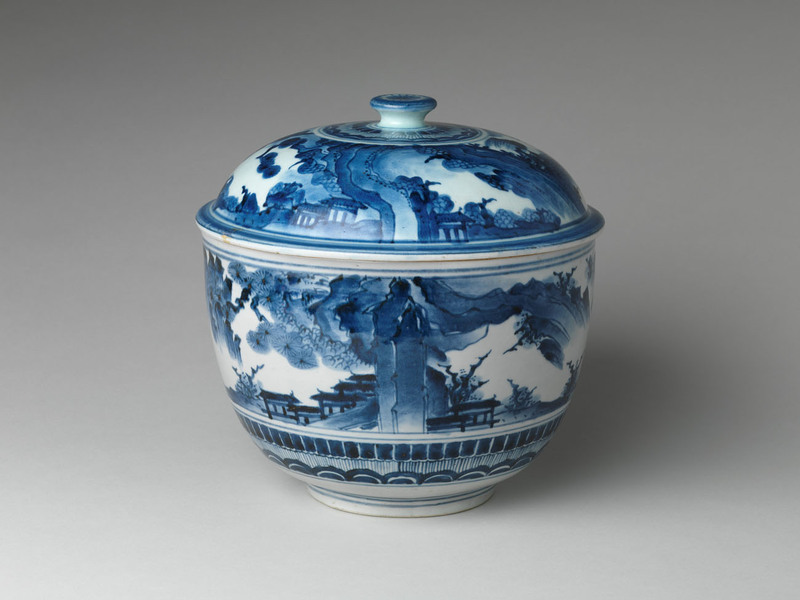 They would not have been made for the domestic market, but were produced for export to meet the demand at the end of the seventeenth century for blue-and-white porcelain in Southeast Asia, the Near East, and markets as far away as Western Europe and the Americas. In Japan, this period corresponded with the flourishing of the local porcelain industry during the first century of the Edo Period, which began in 1615. In the Dutch Republic (modern Netherlands), it corresponded with the height of the Golden Age of Dutch painting; Rembrandt died in 1669. In England, it corresponded with the reign of Charles II (1660–1685); the rebuilding of Saint Paul’s Cathedral, supervised by Christopher Wren, began in 1675. And, in North America, it corresponded with the establishment of the English crown colonies of New York, New Jersey, and Delaware in 1664, and the founding of Charles Town (modern Charleston) in the Carolina territory. From Arita, the bowls would have been manually transported to Imari, a nearby port in the north of Kyushu for shipment to Nagasaki, the large harbor on the west coast of the island. 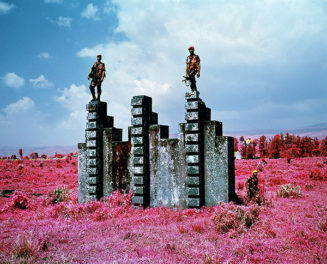 At the time, Japan had instituted a policy of national seclusion, and only Chinese or Dutch tradesmen were granted access to the port. There, each had a small trading settlement (“factory”) from which they were able to exchange goods. The bowls would have been part of a Chinese or Dutch cargo that was then sailed across the East China Sea, past the northern end of the Philippines, and across the South China Sea to Indonesia, most likely to Batavia (modern Jakarta) or to the nearby former harbor of Bantam, both on the island of Java. It was a journey of about 3,700 miles (5,950 kilometers). Batavia had been established by the Dutch East India Company (V.O.C.) in 1619 and, by the 1660s, was a busy harbor with traders from all continents. Goods from throughout Southeast Asia were brought there and exchanged for transport to different countries. The bowls would then have been taken by Dutch or English traders on the staggeringly long voyage from Java—across the Indian Ocean, around the southern tip of Africa, up the expanse of the Atlantic Ocean to reach the North Sea via the English Channel, finally ending at either Amsterdam or London. The entire trip halfway around the world from Japan, of about 20,000 miles (32,000 kilometers), would have taken over a year. If the bowls were indeed shipped to Amsterdam, they were soon transported the relatively short distance to London. It is in that city that they were most likely transformed into their present appearance with the addition of elaborately designed gilt-bronze mounts. Like Batavia, London was a large and vibrant commercial center with an international community of merchants and craftsmen. The decorative handles in the form of greyhounds are similar in form to works in silver gilt made by a Swiss goldsmith named Wolfgang Howzer who was active in London between about 1660 and 1688. It is possible that the mounts on the bowls were made in Howzer’s studio, or by a contemporary metalsmith working in his style, though we don’t know for sure. The addition of the gilt-bronze mounts transformed the relatively simple silhouette of the Japanese lidded bowls into a more complex European profile with a broad foot, elaborate handles, and a decorative finial. The mounts were also meant to highlight the importance of the bowls as items to be treasured and collected. As picturesque objects from the Far East, these porcelains would have been acquired by a wealthy collector and placed on a cabinet, table, or shelf as interior decoration. Such pieces strongly influenced the taste for all things “Chinese” that was a significant aspect of European design for the next century. The bowls’ owners and whereabouts from the late 1600s until the mid-1900s are, for now, secrets known only to them. At some point during those 250 or more years, the pair of mounted bowls made their way from England, across the Atlantic, and ended up in the United States in the possession of Joseph Downs, an eminent museum curator and specialist of American decorative arts. They were in his possession at the time of his death in Philadelphia, Pennsylvania, in 1954. Downs was born in Massachusetts in 1895 and began his museum career at the Boston Museum of Fine Arts. 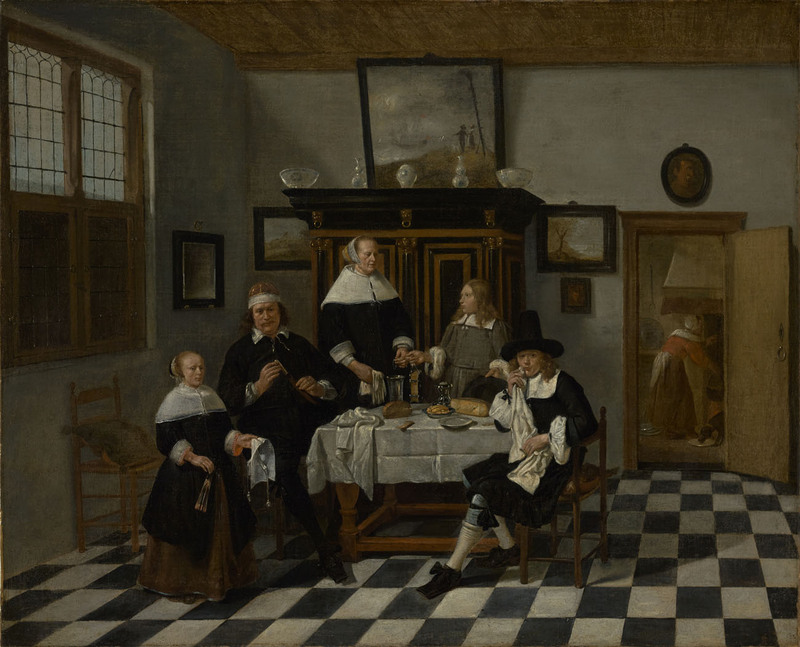 Then he was a curator of decorative arts at the Philadelphia Museum of Art, and later at the Metropolitan Museum of Art in New York City, where he became curator of the American Wing. In 1949, he became the curator at Winterthur in Delaware, the premier museum of American decorative arts, where he remained until his death five years later at the age of 59. The mounted bowls passed to William Heer, a friend of Downs’s and executor of his estate. Heer died in 1983, and the bowls were then auctioned at Christie, Manson & Woods at 502 Park Avenue in New York City on October 29, 1983. They were acquired at the sale by the French antiques firm Galerie Aveline and sent to their shop in Paris, then at 20 rue du Cirque, just off the exclusive Rue du Faubourg Saint-Honoré and one block from the Elysée Palace. 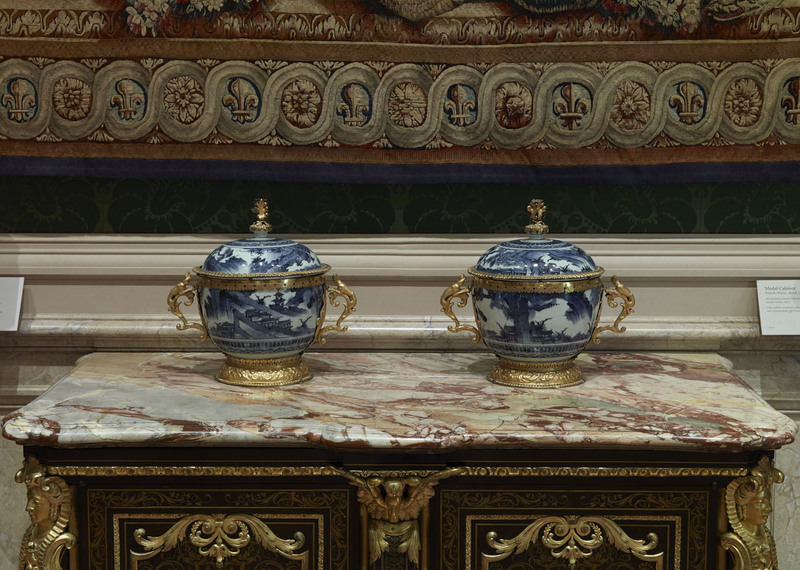 Two years later, the pair of mounted bowls were presented for acquisition from the Galerie Aveline to the J. Paul Getty Museum by Gillian Wilson, the museum’s founding curator of decorative arts. 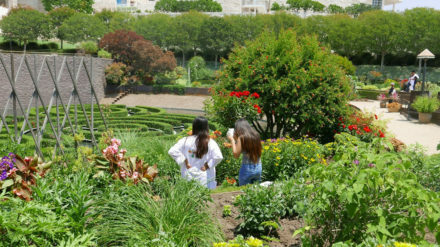 They were purchased and moved back to America to the Getty Museum in Malibu (the current Getty Villa), where they were put on display on the second floor with the rest of the Museum’s collection of fine and decorative arts. The mounted bowls remained in Malibu until they were transferred to the new museum at the Getty Center in West Los Angeles in 1997 and installed in one of the galleries devoted to the decorative arts. 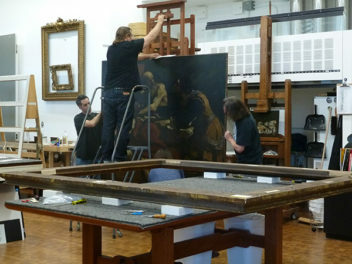 In 2013, they were temporarily split—one of the pair was included in the focus exhibition The Life of Art: Context, Collecting, and Display, where it remains today. The life story of this pair of mounted bowls has particular resonance for me, another curator of decorative arts. A favorite object of mine at home is a small Chinese blue-and-white porcelain bowl and dish that, like the large pair of mounted bowls at the Getty once owned by Joseph Downs, were created in East Asia at end of the seventeenth century and are now—after a rather extraordinary journey—residing in Los Angeles. My bowl and dish were made at a kiln in southern China around 1690 for the export market. They were included in the cargo of a Chinese ship that sailed from southern China and across the South China Sea before sinking off the coast of Vietnam between about 1690 and 1700, possibly as a result of a fire on board. There the remains of the ship and its cargo sat for 300 years before the wreck was discovered in the 1980s, and the surviving items salvaged in 1991. The ship, referred to as the Vung Tau cargo, was probably bound for Indonesia, possibly Batavia, where its contents could be acquired by other merchants for transport further afield. 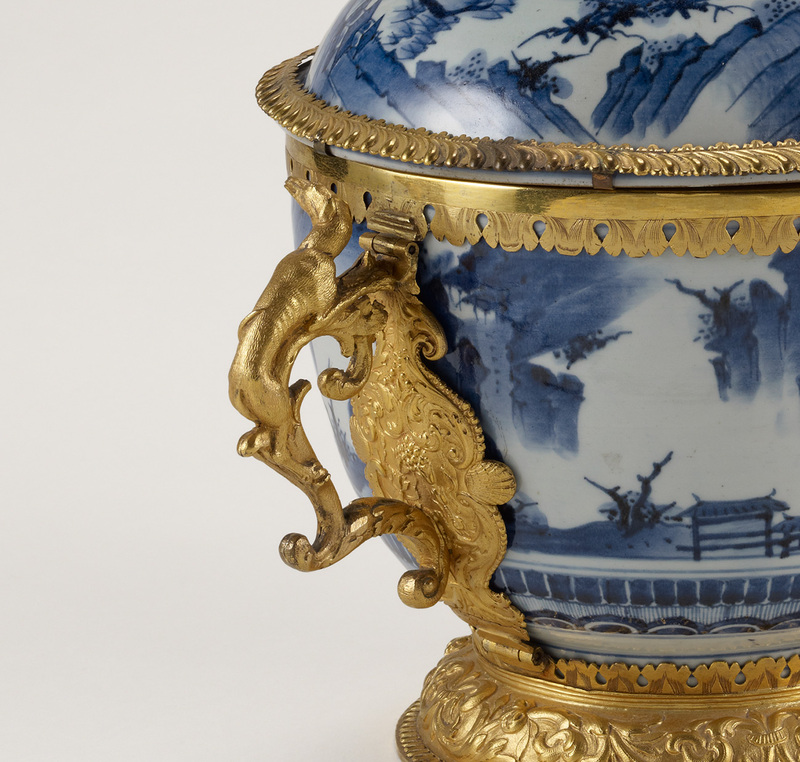 It never made it, and of the more than 48,000 pieces of Chinese porcelain that were recovered, 28,000 of these were sent to Amsterdam and auctioned there by Christie’s in April 1992. My bowl and dish were subsequently with an English dealer of ceramics from which I acquired them a few years later at the Fine Art and Antiques Fair at Olympia, London. Today the bowl and dish are in a cabinet in my dining room in the Mid-Wilshire neighborhood of L.A. 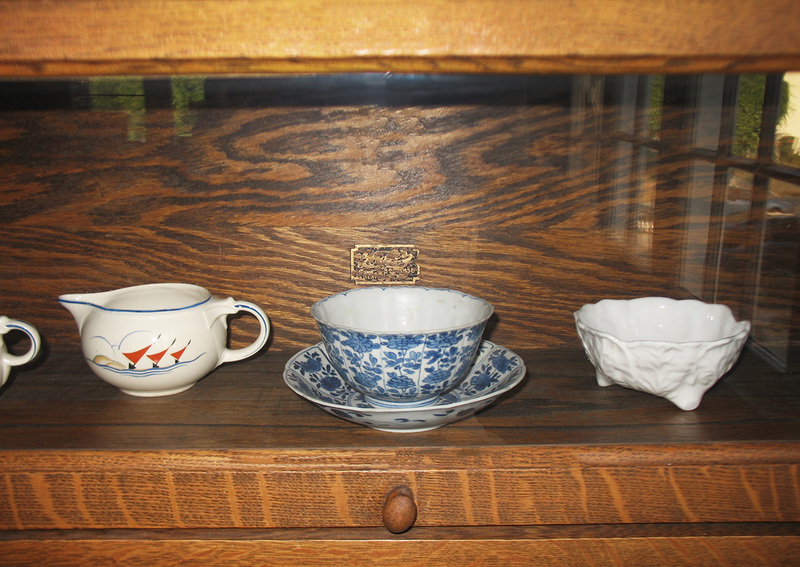 There they sit between a modern Wedgwood sugar bowl I purchased at Peter Jones, a department store in Sloane Square, London, and a creamer, made in 1936 by Taylor, Smith & Taylor in Chester, West Virginia, bought at a consignment store in Palm Springs. Knowing the history of two sets of objects that intrigue me—one at work, one at home—opens a window into their past and helps me appreciate them all the more. Next time you look at an heirloom you inherited, a piece of art you collected, or any object you encounter in a museum, I hope you’ll think of the different places it may have been and the fascinating stories that lie behind it. Join Jeffrey Weaver on the Getty Museum’s Facebook page for a live video tour of the exhibition The Life of Art, home to this seventeenth-century bowl, on Thursday, September 22, at 9:30 a.m. Pacific Time.